If you’re a family looking to relocate to Blowing Rock, North Carolina, you’ll be pleased to learn that this mountain town has its very own amusement park. It’s rather quaint and small, but it’s a park of amusement, nonetheless. Tweetsie Railroad is a “Wild West Theme Park,” centered on the days of old and family fun. If you enjoy adventure and old-fashioned entertainment, you’ll want to take a trip to Tweetsie. The property includes the park, the kid zone, places to eat, shops, a deer park habitat, and of course the star of the show, the Tweetsie Trains. Their season generally begins in early April and closes shortly after Halloween. During the summer months, they are open seven days a week; otherwise, for spring and fall, they’re open Fridays, Saturdays, Sundays, and an occasional holiday-Monday. Admission is a little pricey, but many say it’s at least worth a one-time experience. Some people are avid park-goers and purchase season passes. Others make it a family tradition to come once a year. You’ll find adults who came to Tweetsie as children and are now bringing their children. Even residents who aren’t enticed to come to Tweetsie can still enjoy hearing the sound of the steam engines’ whistles. It’s an unmistakable noise heard miles and miles away that brings a smile to your face. Now just imagine the smiles of those riding in the train cars. Additional park rides include a chair lift, carousel, Ferris wheel, water boats, and a scrambler, to name a few. The live entertainment is great, as well. Shows and performances vary, but you’ll enjoy whatever’s featured – adults and kids, alike. Tweetsie is much more than the fun it affords. It’s a symbol of what was and a medium for history. It’s a cherished attraction in Blowing Rock, by both those who’ve paid to see it up close and those who simply drive by on a regular basis. 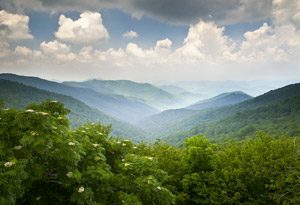 If you’re searching for homes for sale in Blowing Rock, you’ll never be too far away.